Tim Homan leads his fellow hikers along 34 trails and trail sections, a 100-mile network that winds through the North Carolina high country (ten peaks over 6,000 feet) of two wildernesses - Shining Rock and Middle Prong - and the Blue Ridge Parkway corridor south of both wildernesses. 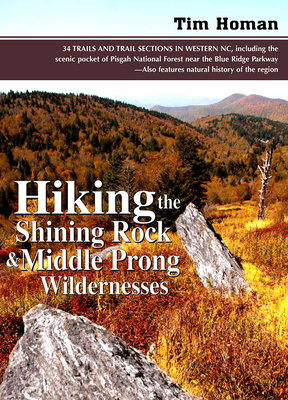 The trail network also includes a pocket of nonwilderness -- Pisgah National Forest land between the parkway and the Shining Rock Wilderness. Following an informative introduction to the area, Homan provides detailed, in-depth trail narratives. He has divided the guide into six chapters that group trails according to regional cohesion and connectivity. Extensive nature notes including species' profiles, bloom dates for numerous wildflowers, and black and white botanical drawings frequently follow the in-depth trail narratives.